Good Morning Friends! I hope you're all doing well as we count down the last week of 2009. Can you believe this? Where does the time go? I have some very exciting news to share. 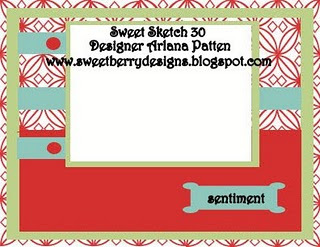 I received an email from Arlana, owner of Sweet Sketch Wednesday challenge blog, inviting me to join the design team. Of course I didn't hesitate to accept! I love her sketches, Arlana challenges me, unbeknownst to her, to create my sketches to be fun to work with and user friendly, yet challenge your creative skills. 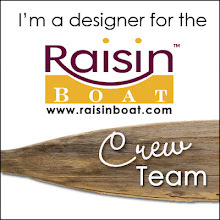 So I am proud to say that I am the newest member on the design team for Sweet Sketch Wednesday. Arlana sent me a very adorable image from this week's sponsor, Squigglefly. She must know how much I love snowmen! So here's my take on the sketch. This is Marching Snowman and I'm not sure where he's off to, but he's certainly on a mission to spread some well chilled happiness. I colored him with Copics, attempting to keep to a more earthy, natural palette. Hard to do when I am still working on my collection of Copics, but it did come out pretty nice. 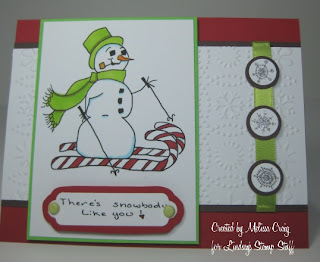 The background paper came from My Time Made Easy, Lauren is offering 12 Days of Snowflakes digi-paper for free and it was just what I needed to complete this card. 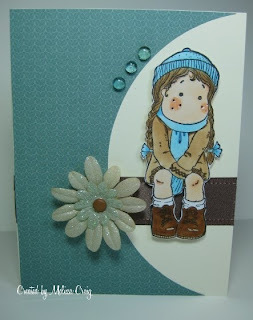 Now be sure to check out Sweet Sketch Wednesday and link up so we can see what you created. I'll be looking! Thanks for stopping by - have a SWEET day. Late post today - I was hoping that I'd be able to get day 8 and 9 done for the TGF sketches, but I'm still working on them. So I'll just post my little ol' card that I made for my challenge blog (what a novel idea) in hopes you'll want to join us. The sponsor is Pixie Dust Studio. The picture isn't that great. I broke one of my lamps last week and I haven't had the chance to replace it. I couldn't believe it, too. I bumped it and it fell and the housing for the bulb shattered! Anyway, this is my card. 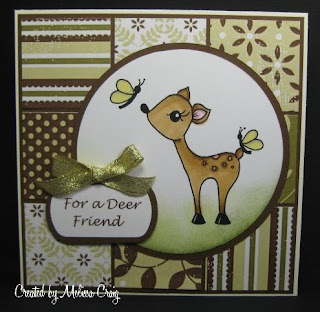 I used two images from Kathy's recent release of Forest Friends. I used some very old paper from SU! - the woodgrain paper pack to create my frame. I really wanted an old, distressed look so I inked everything up with Antique Linen Distress Ink (I need a new one, I was really working to get ink off that pad). 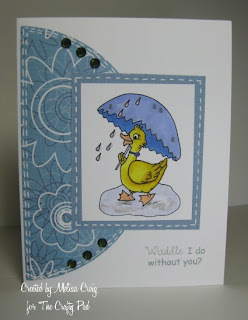 The sentiment is from CC Designs and then embellished with primas and pearls. 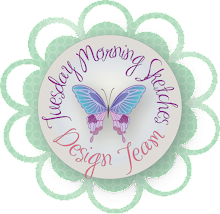 I hope to see you join us at Tuesday Morning Sketches! Thanks for stopping by. Good Morning! Well, what's left of it anyway. This is Mikey, the latest addition to the Inktegrity family of animals. He won't be available until January 15th, but Joni is running a little contest called "What Can I say?" Now that you've seen a part of Mikey, she needs YOU to come up with a Valentine's Day related sentiment for him. She will pick 3 winners who will receive Mikey and Sammy (you'll meet him on January 13th). So put those thinking caps on - go visit the Inktegrity blog to submit your entries! Happy Sunday to you! It's a gorgeous day here. The sun is shining, it's fairly pleasant outside and a lot of the snow is melted away. 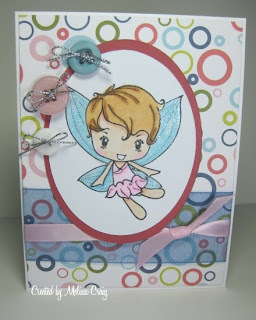 Day 7's sketch was great fun - this one is by Jessica (Whimsical Butterfly) and it holds so many possibilities. I used a kit that I'd received in another card kit swap that my friend Jackie hosted, so I'm sorry, I don't know the name of this fairy. I still can't get into the store or galleria - so I'm thankful that my sister is uploading for me. I colored her with Copics and then glittered her wings with Martha Stewart glitter. I actually bought a bottle of the glitter and poured it into a plastic storage container and then poured the remaining half container of Dazzling Diamonds glitter in with it. I LOVE the results! Thanks for stopping by! I hope the rest of your weekend is great! Hello. I hope everyone had a wonderful Christmas. We did. It was very enjoyable despite the threat of an ice storm, but it was actually warmer at 10pm than it was at 4pm. Crazy! I have two posts for today - and check back, who knows, I may end up being very productive and get more done! The first is Sketch Day 6 from The Greeting Farm. 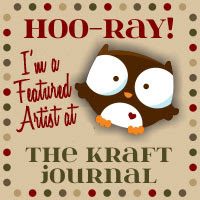 This was a fun sketch from Cindy Haffner - I had fun using it and my card actually came together very quickly. I used the frog from Down by the Pond. You can't help but smile looking into this guy's face. I colored him with Copics and then used Broken China and Certainly Celery to lightly ink over the image. 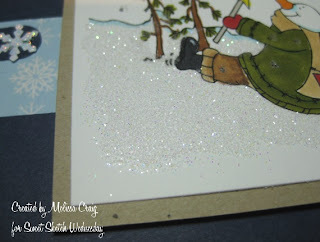 The paper is actually Christmas DP, but it worked really well for this everyday card. I got a Slice for Christmas so I used that to create my sentiment. This next card is using the sketch from Friday Sketchers. 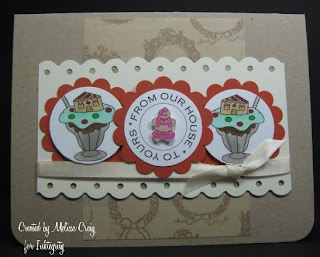 I enjoyed their blog hop immensely - this is one extremely talented Design Team. I can't compete, but this was fun. I don't know which Tilda this is nor do I know the paper. I had participated in a Magnolia Card Kit swap and this was one of the treasures I have in my kit box. It was time to play! I love the colors! Brown and blue is one of my favorite color combos. It's all on a base of Very Vanilla. She's colored with Copics. I hope you enjoyed my cards that I have to share with you today. I wish you a happy weekend! Hello! This is my 2nd post today. I finished my card for Day 5 of the 12 Days of Sketches from The Greeting Farm and I liked it so much, I had to post again and not wait until tomorrow. I used Valentine Anya & Ian and I am so excited that I was finally able to play with this digi! Aren't they the sweetest couple?! The base is Neenah Classic Crest Solar White card stock. 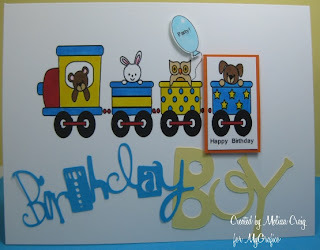 The decorative paper is American Crafts and other card stock used is Certainly Celery and Bashful Blue. I also used American Crafts rub-ons. The sentiment is computer generated that I created. I added a couple extra elements, but we all know how I feel about sketches... they are simply a jumping off point. Well, we're off to go dig out my Mom's car so that she's mobile again. Then back to get ready for company and the final touches for Christmas. Enjoy your day - thanks for stopping by. ...TGF gave to me. Are you playing along with TGF's 12 days of sketches? This is a countdown to the New Year. I can't upload these to the TGF Galleria myself because for some weird reason the site will not load for me. So my sweet sister is uploading them for me so that I can play along - but I thought I'd share them here to. This is for Sketch Day 2. I used Miss Anya. 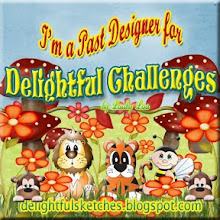 I have to say that I am thrilled to be participating in this challenge because my TGF stamps have been very neglected. So this girl was happy to be taking a dip in the ink again. I used rub-ons from American Crafts, I scored this big pack for $2 at Big Lots. The base is Kraft card stock with the white rub-ons. Then I stamped the image on Very Vanilla for contrast. Sketch Day 3 was tough for me. The image is from the For Someone set. I love this image, so versatile. With reds it would look like a poinsettia plant. The base is Chocolate Chip and the other color is Pale Plum. It worked very well with the pretty dp. The swirl is Thickers chipboard. Sketch Day 4 is by far my favorite. I love these colors, they are so happy and very striking with the black contrast. I found a favorite green combo in my Copics for her dress. This is YG00 Mimosa Yellow and YG03 Yellow Green. I hope you like my take on the sketches... can't wait to play with today's sketch! Thanks for stopping by! Good Morning! 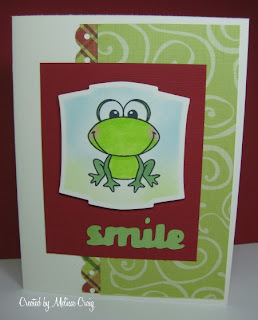 I thought I'd share a card today that I made for my challenge blog, Tuesday Morning Sketches. I hope you join me and my wonderful team - our awesome sponsor this week is Soft Pencil. They carry some very adorable digi-stamps. I took this picture in hopes that I'd capture the snow in the background, but instead its too white. 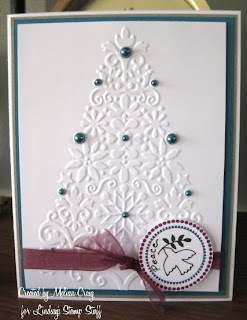 But you can still see the very cute image, the soft snowflakes that I embossed with white embossing powder and my very favorite Inkadinkadoo snowflake stamps. I colored the image with Copics and then added a touch of glitter. Oooh! 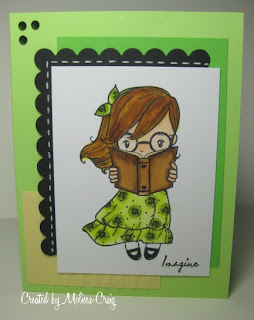 I am also very happy that I can enter my card in a theme challenge, too! Digital Tuesday says SNOWFLAKES. I hope you join us over at my challenge blog. Have a wonderful day! Good Morning! Happy Sunday to you! Did you hear about all the snow we got? Well we're digging out from about 16-17" of snow. It's gorgeous outside right now - the sun is shining and the snow is glistening. 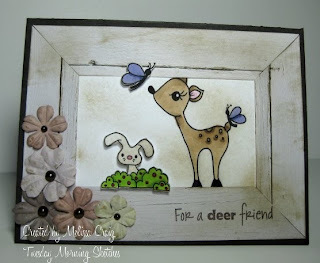 A couple of weeks ago I won a challenge over at The Crafty Pad. My prize was an adorable digi and a Guest Designer Spot. My card is featured with today's new challenge! This is Roshell and she along with some other ducky friends will be released in January. The challenge is easy, use stitching. Real or Faux, either work. I used a sketch from my Tuesday Morning Sketches challenge from last week for my layout. I wanted a very clean card and this color combo worked perfect for that. My stitching is faux stitching with a white gel pen. 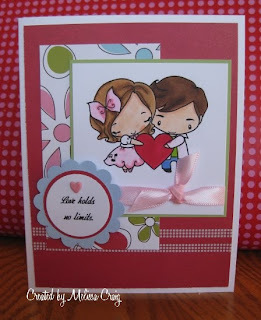 I colored the image with Copics and then finished it off with a perfect sentiment from Sweet n Sassy Stamps. I hope to see you join in the challenge! Enjoy the rest of your weekend. Good Morning Everyone! I have a quick post for you today. It's too late for Friday Sketchers for last week, but I wanted to share it with you anyway. This is my last card for the monthly card swap. This was a great sketch to follow. I used the image and paper provided by the hostess. Sorry, don't know what either one is. Cute, though! 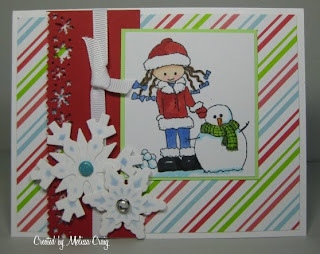 I used MS snowflakes border punch and then used Create a Snowflake one and two for the embellishments. And now to check out this week's sketch... maybe I'll get this one posted on time. Thanks for stopping by. Good Morning! It's bright and sunny and very chilly here in WV. So with that kind of weather, it leads to thoughts of snowmen, hot chocolate and peppermint sticks. 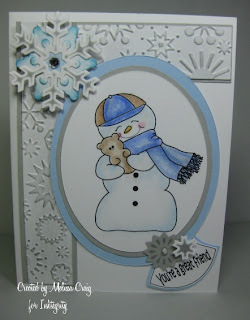 This fun snowman is from Lindsay's Stamp Stuff Warm Winter set. The set comes with a few snowman images, sentiments, snowflakes, mugs of hot chocolate and hot chocolate packet. 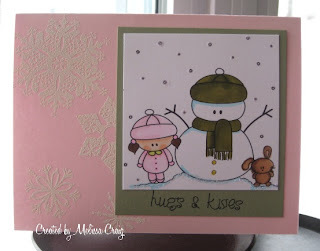 It's perfect for Christmas and Winter greetings and pages. It's only $5 and don't forget that for every $5 you spend, you get a free stamp. And you still have time to get in on her holiday sale, buy 2 sets, get one free!! Sweet Sketch Wednesday - The Sketch. Arlana did it again! The Color Dare - Really Green Chocolate. I love that title! Use Really Red, Green Galore and Chocolate Chip. This was a very fun color combo. I hope you enjoy my card and don't forget to visit Lindsay and the rest of the team for more awesome ideas! OK - better late than never right? I am finally done with my card and am ready to post for today! This is one of the three sets being released today from Inktegrity. This is Bear Hug and he's just the sweetest snowboy ever! Of course I had to play along with a few challenges, which is why I took so long to post - not to mention being distracted by a movie streaming in on my computer. I really need to use my iPod more often. Thanks for stopping by today. I promise I'll be more on time the rest of the week. Good Morning! I hope you all had a great weekend. I did enjoy mine, I took my kids Christmas shopping. It was interesting to say the least, taking Hollyanne and Levi at the same time when they were shopping for each other. Well, it is with a saddened heart that today is my last posting for Sunshine & Giggles. 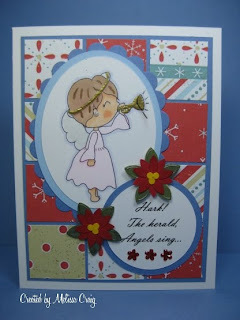 I have enjoyed being on Janice's team these last 6 months and working with some very talented stampers. Janice is such a sweetheart. So I want to take this time to tell Janice, Jennifer, Nicole, Tenia (original DT member) and Joni THANK YOU from the bottom of my heart for this experience. I am certain that the next team will be wonderful and I know that there are some great things coming in the future for Sunshine & Giggles. There is nothing more charming than seeing a child sitting on Santa's lap conveying all his gifty desires - whether it's your children or memories of yourself as a child. Do you remember this image? I used it on an altered bottle filled with m&ms. Well, the kids got the m&ms and I was left with this image. 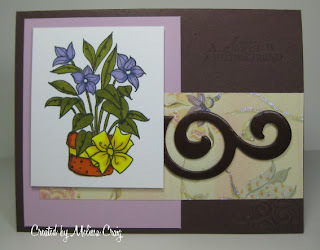 So, it needed a more permanent place - it became the focal image of this card. 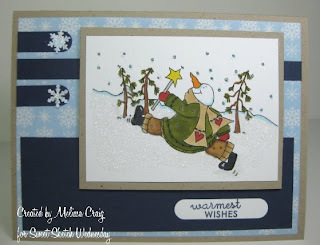 The card went together in just minutes, which is what I need to get my own Christmas cards done! I hope you continue to follow Janice and Sunshine & Giggles. 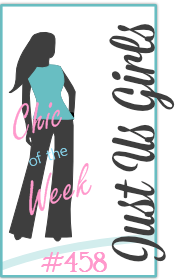 Be sure to stop by Joni, Jennifer and Nicole's blogs, too. I'm sure they have something wonderful to share with you. Good Morning! The final day has come. And it's Friday! Whoo-hooo. I think we're getting our Christmas tree this weekend. 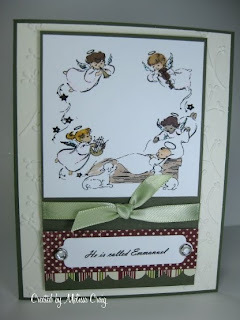 I had set out to create a card that had a more heavenly quality and less whimsical. 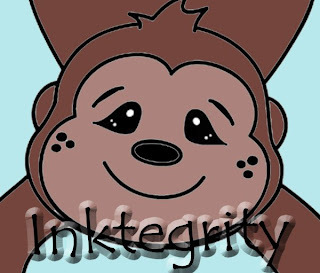 I did a search on digi-images and I didn't come across exactly what I was looking for, so then I went the coloring pages route and I came across this image at CDK Kids dot com. It really loses some of it's beauty by being printed so small, but it's still very pretty. I colored the image with Copics, which wasn't my original intention. I had wanted to pull out my Prismacolor pencils that I neglected this whole series. But Copics were the better choice for the small areas. The sentiment is computer generated and says He is called Emmanuel, which means God with us. 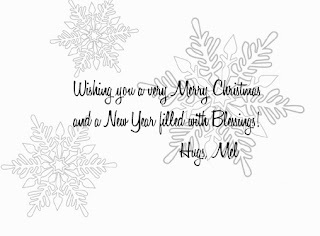 Thank you so much for joining me on the journey of 15 days of Christmas cards. I probably won't stop there, but who knows. I have some snow-people in my collection that are still begging to be played with. Winter just started, so we have a long way to go. Enjoy your weekend although I hope to see you here! Good Morning! Welcome to day 14, which is also Thursdays with Lindsay and it's also the MyGrafico Challenge blog posting. Whew!! First off, let me mention that Lindsay is having a buy 2 get 1 free sale at her Shop Handmade Store. When you make your purchase of the two sets, Lindsay will email them to you and get your order for your free set. Pretty easy, eh? I created a really easy Christmas card by using the Cutttlebug Christmas Tree folder as the main image, but leaving it white and enhancing with Teal pearls. The circle image, the dove is from Lindsay's Christmas Cupcake Wrappers set. I played around in PSE to change the color. I'm sure I didn't do it per any tutorial, but I managed to change the outer dots to a berry color and in the inner dots to a teal color. This card is using the current color challenge from The Color Dare Challenge, which is to use Razzleberry, Taken with Teal and Kraft. I don't have Razzleberry ink but I was able to color match it pretty close for the dots and the ribbon. 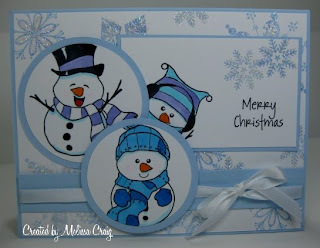 The card has a base of white and the mats are Kraft and Taken with Teal. 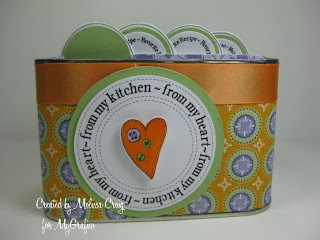 This week MyGrafico Challenge Blog decided to use the recipe set from Lindsays Stamp Stuff and that was fun since I am on both design teams. So I set out to create my friend a recipe box. I took an instant coffee can and covered it with this really fun paper. Her kitchen is sort of multi-colored fiesta hues, so I thought this purple and orange would fit right in. I printed the circle sentiment twice so that I could pop-dot the heart in the center to give it a little dimension. Then I proceeded to make the cards. Yes, they are folders. I did this by importing the recipe card image into a word document twice and flipping one of the images upside down. Then I butted the images up against one another and cut them out. Using a circle punch I notched out the bottom end which removed the the tab. 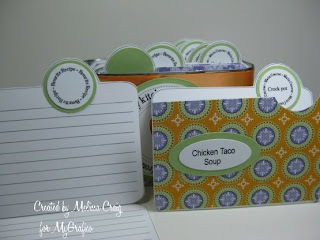 Some I typed the recipes onto the cards first and then printed them out. Some, I just printed with the lines on them so that my friend can add her own recipes. I'm still not done with the box, there are several other recipes that she requested of me, so I need to get busy typing. I hope you enjoyed my Christmas card and recipe box. Please be sure to visit Lindsay and the rest of team to see what they have to share with you. And don't forget the challenge at MyGrafico, you could win the entire recipe set. 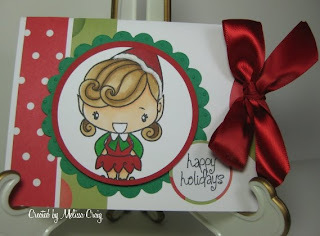 See you tomorrow for the last day of my Christmas Cards Series. Good Morning! Welcome to Day 11, thanks for stopping by. I so appreciate the visit. This is also Sunshine Monday. As my term for being a Design Team member of Sunshine & Giggles comes to an end this month, it's only fitting that my very favorite image from the Winter/Christmas collection be a part of my Christmas Cards series. I am so pleased with how this card turned out. It reminds me of a really pretty Christmas dress. This is Poinsettia. 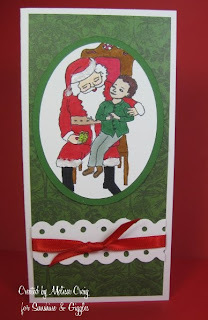 I used black card stock for my base and then layered dp from the DCWV Christmas mat stack over that. I also used the same paper in the burgundy and another in green to paper piece her dress. And I was excited to start using my new MS border punch. The hearts fit in so well, even though this is a Christmas card. I colored her with Copics and then finished it off with some gold ribbon. Be sure to visit Janice and the rest of the team (linked in my sidebar) to see what treats they have waiting for you. I just learned that Janice isn't posting today, she and her son are a bit under the weather. See you tomorrow for day 12. Good Morning! I hope you've had a good weekend so far. Saturday was a bit crazy - Hollyanne is in her first Christmas concert today, she's a first year (and probably last year) violinist. I also used the sketch (again) from Sweet Sketch Wednesday. I really loved this sketch from Arlana. I also participated in The Color Dare challenge, too. This was quite a challenge for me, too. The colors: Kraft, Very Vanilla and Dusty Durango. 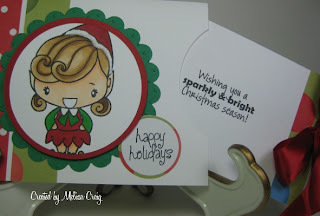 The challenge for me was how was I going to incorporate those colors into a Christmas card. And then it occurred to me that these colors are homey baking colors, if that makes any sense. 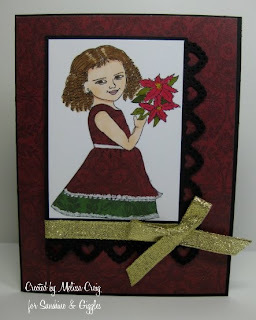 I also used a gingerbread girl image from the Daisie Company. This was a tough on the old eyes to color something that tiny and then cut it out. Whew! I hope you enjoyed my day 10 card and that you'll come back here tomorrow for day 11, which also happens to be Sunshine Monday. Thanks for stopping by.